A Landmaster in Super Smash Bros. for Wii U.
Landmaster (ランドマスター, Landmaster) is Fox and Falco's Final Smash in Super Smash Bros. Brawl and Super Smash Bros. 4, as well as Wolf's Final Smash in Brawl. While all three characters control the same basic vehicle, each model has its own modified attributes. The Landmaster is a large and powerful machine, capable of delivering multiple KOs to a single player or group. The player cannot take damage, though self-destructs are not impossible with these heavy and somewhat unwieldy tanks. Upon using the Final Smash, the user leaps straight upward and off screen (passing through all barriers and damaging anything in their path), where the Landmaster is dropped in his place. While other players can stand on the vehicle without taking damage, they would be ill advised to do so for long, as the Landmaster has various means of attack from both short and long range. The Landmaster's main weapon is the cannon, activated using the attack or special move button, which fires a quick blast. The attack will hit any characters in its path, as well as those standing on the cannon's barrel. The other means of direct attack, aside from simply landing on opponents or driving into them, is the roll, also commonly known as a 'barrel roll'. Pressing down on the Analog stick, or the D-Pad if the player is using a Wii Remote on its side causes the ship to roll-over in place, damaging everything near it. The Landmaster loses its platform while rolling so even characters that are invincible still cannot stand on the Landmaster while it is rolling. If the Landmaster is on a soft or supersoft platform, it will drop through instead of rolling. Using the jump button, the vehicle's jets can also carry it upward for a good amount of time. Though it can not fire while hovering, it does have enough lift to carry opponents above it beyond the upper blast line for a star KO or screen KO. As the cannon is a soft platform, players attempting to escape can drop through it. As of SSB4, it is possible to fire while in the air, but doing so would cut off the hovering, forcing the Landmaster to drop down. Unlike in Brawl, it can now lift players off of their revival platform and can possibly nudge it sideways from its original position. After a time, the Landmaster begins to blink (indicating the end of the final smash) and soon fades away as a blueprint wire-frame, and the pilot will jump out while still invulnerable. The invincibility will last until a short time after the pilot lands on the ground or after they exceed a certain amount of time in the air. The Landmaster is impervious to stage hazards, and unaffected by conveyor belts, but sinks in water. While the character piloting the Landmaster cannot be damaged, it still has a hitbox, meaning the remaining time of the Final Smash can be shortened by attacking the Landmaster. In normal gameplay, this may not cause a significant reduction, as the amount of damage that must be given is enormous. However, it is relatively easy to 'destroy' the Landmaster by using hacks. The Landmaster originally appeared in Star Fox 64 (known as Lylat Wars in PAL regions). On the planets Titania and Macbeth, the Star Fox team must use the Landmaster tanks to complete their objectives. The abilities to roll over (known as a barrel roll in this game) and temporarily hover were both in the original game. It also appears in Star Fox: Assault. The tank's appearance is a cross between its Star Fox 64 look and its Star Fox Assault look. It maintains the sharp and futuristic appearance it had in Assault, but still has traditional tank treads, as it did in Star Fox 64 (in Star Fox Assault, the Landmaster ran on off-road wheels). Falco has an open hatred of the Landmaster in Star Fox 64, never using it outside of multiplayer. This is referenced by his quote "I prefer the air" upon activating the Final Smash, and his Landmaster being more air-oriented. 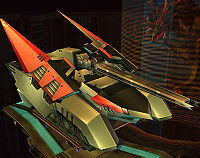 According to Falco's Final Smash trophy, Landmasters are manufactured as a regular military tank, with the Star Fox variety customized by Slippy. Wolf, who is a member of the ragtag, rival faction of Star Wolf, has never been seen using a Landmaster. The trophy description says Wolf examined Fox's Landmaster and created a improved version for himself. In the Japanese version, Wolf's Final Smash is named 'Landmaster Kai', which can be translated into Landmaster Custom, indicating that Wolf's model is a customized version. Wolf's Landmaster also resembles the Venomian Landmasters from Star Fox 64. When Fox activates said vehicle, he will shout "Landmaster!" (ランドマスター!) while performing his initial jump. This model of the Landmaster is the most balanced of the three, having centered out strength and maneuverability, as well as time. It, like Falco's, lasts 18 seconds. While powerful, this make has somewhat slow turning, driving backwards a short distance before actually whirling around (17%); and has the slowest falling speed. If an opponent is tackled by the tank, they will generally take 15% damage (depending on the speed), and each cannon blast deals 17%. Its biggest drawback is low jet speed, making it much harder to Star KO by hovering upwards. In Super Smash Bros. 4, Fox's Landmaster can only stay in battle for 12 seconds. Landmaster (Fox) trophy in Brawl. Fox's Final Smash. Climb aboard the Landmaster tank, the ultra-high performance, anti-air, rolling combat vehicle of Team Star Fox. Just like in the Star Fox series, the cannon can be used to blast foes, and the tank can roll over enemies. The jets beneath the main body can be used to hover. Between its firepower and mobility, this tank knows no equal. Landmaster (Fox) trophy in for Wii U. Originally designed for exploration, the Landmaster in Fox's Final Smash has been converted into an ultra-high-performance, anti-air, rolling combat vehicle. When Fox hops aboard, he can drive or roll into foes and blast them with cannon fire. It can even fire in midair. And best of all, Fox is safe from damage inside this metal beast! 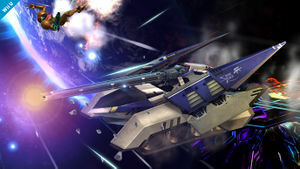 Originally designed for exploration, the Landmaster in Fox's Final Smash has been converted into an ultra-high-performance, anti-air, rolling combat vehicle. When Fox gets on board, he can drive or roll into foes and blast them with cannon fire. It can even fire in mid-air. And best of all, Fox won't take any damage while inside! Falco Lombardi's Landmaster appears to be very similar to Fox McCloud's Final Smash. Almost visually identical, its attacks are slightly weaker though still very powerful. Though the shots fired and the normal hits are far weaker, it is interesting to note that when the enemy is hit by a shot while standing on the cannon barrel, it is stronger than Fox's Landmaster. His 'Barrel roll' gives more damage than Fox's and Wolf's, but is bad on its knockback. The knockback of the roll is vertical. The one noticeable difference is that Falco's jump jets go higher. Falco's Landmaster can fly faster than Fox's, equaling Wolf's speed, which can make easier star-KO's to anyone standing on top of it. Falco's Landmaster is as fast as Wolf's in the air but is slower than both Wolf's and Fox's on the ground. It also lasts as long as Fox's. A CPU can be tricked into maneuvering the Landmaster straight off of the stage during the first few seconds of Falco or Wolf's version of this attack. Doing this with Fox is much more difficult, due to his Landmaster's low air speed. In Super Smash Bros. 4, Falco's Landmaster can only stay in battle for 12 seconds. Landmaster (Falco) trophy in Brawl. Falco's Final Smash. He jumps aboard the Landmaster high-spec, anti-craft tank. With the tank's powerful cannon blasts and rolling ability, it's possible to take out all enemies at once. The Landmaster is based on actual production vehicles, but Team Star Fox's Landmaster was customized by the team's mechanic, Slippy Toad. Landmaster (Falco) trophy in for Wii U.
Falco jumps aboard his landmaster for his Final Smash, This powerful combat vehicle sports an explosive cannon and a heavily armored exterior. Falco can blast other fighters or simply drive into them with his tank. This landmaster also flies higher than Fox's, letting Falco give his rivals a pick-me-up...off the stage! With immense firepower and tough armour, the Landmaster makes for a mighty Final Smash. 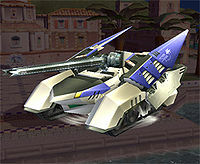 Falco can use this fine combat vehicle to run down and roll into rivals, as well as inundate them with cannon blasts. His Landmaster can hover a bit higher than Fox's making it easier to pick rivals up and give them a nice comfy ride off the stage! When Wolf activates the Landmaster, he shouts "We're gonna have fun with this thing!" (or "こいつで遊んでやるぜ!" in Japanese, literally meaning "I'll play with you with this!") during his initial jump. Wolf's Landmaster has the same appearance of Fox's and Falco's, only sporting the red color of his Wolfen and the notable absence of the Star Fox logo on the side panel. Wolf's Landmaster is more powerful than Fox or Falco's, capable of dealing more damage with high knockback. Its blasts are shot much faster, and its overall feel is more aggressive than Fox or Falco's. It has the fastest ground movement speed of the three as well as fastest lateral air speed. The jet boost is similar to Falco's in that he can use it to Star KO easily. It has the same rising speed as Falco's Landmaster. This Landmaster's only flaw is that it doesn't last very long, lasting only 12 seconds compared to Fox and Falco's Landmaster's 18 seconds. (This is explained as the upgrades causing an increase in fuel consumption.) It also falls faster. While Wolf's Landmaster has the same name in English as Fox's and Falco's, in Japanese it has a distinct name (ランドマスター改, Landmaster Revised). Landmaster (Wolf) trophy in Brawl. Wolf's Final Smash. Wolf analyzed Fox's Landmaster and built his own improved version, which he now calls out and boards. He's increased the output of the on board generators and upped the vehicle's firepower. However, this has substantially decreased the time the Landmaster can appear on the screen. It sports the same colors as Wolf's Wolfen. Due to its height, the cannon of the Landmaster may fire above most character's heads, requiring a bit of strategy to properly use. Due to the Landmaster's height, it can not easily maneuver around tight areas or enclosures, such as those found in the Temple. Once the move is used on Mario Bros., it will be impossible to get to lower parts of the stage (unless the player is in a "Mini" Special Brawl). Despite its height, the Landmaster only requires a small 'player' sized piece of land to rest upon, about the size of a Stage Builder block, as collisions with the floor are only registered at the very center of the tank. This leads to the Landmaster being able to fall down small gaps such as the hole in the center of Yoshi's Island. (The Landmaster can even fall down the width of a single Spin Block during a "Mega" Special Brawl.) Another glitch may occur on Stage Builder-made stages where if the Landmaster moves to certain platforms, it will uncontrollably move up and down vertically. Fox is given infinite uses of his Final Smash in Event 2: Landmaster Ignition to KO Meta Knight and Sheik as many times as possible before the time runs out on the Corneria stage. Landmaster Tank trophy in Melee. Landmaster is one of the five Final Smashes that can affect a team player with Friendly Fire turned off. End of Day, Puff Up, Iceberg, and Galaxia Darkness (Brawl only) share this trait. If a team player is on top of the Landmaster and it flies offscreen, then the teammate will be KOed, though this will not count as a self-destruct. Even when a CPU is level 9, it will not try to lift a character above the upper blast line. Hitting a Metal Box during the Final Smash will turn the character inside metal, but this is not noticeable until the Final Smash ends. Landmaster is one of the Final Smashes shared by multiple characters, along with Triforce Slash, Light Arrow, PK Starstorm, and Critical Hit (in Smash 4). It is also one of two Final Smashes to have ever been shared by more than two characters, the other being Critical Hit. 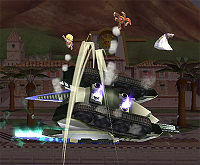 The decision to allow three characters to use a Landmaster in Brawl became a minor in-joke in the years after its release, with some players farcically claiming that the Landmaster was underused in Brawl. A number of image macros made their rounds in response, including character select screens where all characters are replaced by Landmasters, as well as edited in-game images making it appear other characters were using a Landmaster of their own. It is one of two Final Smashes shared by multiple characters to be completely removed between games, alongside Light Arrow. Landmaster is tied with Triforce Slash for the most holders of one near-identical Final Smash, with 3 characters having each. However, Landmaster has the holders of one near-identical Final Smash in one game, since three holders of Triforce Slash have never appeared in one game together, only separately. 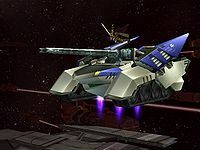 In the Star Fox games, the Landmaster is usually stored within the Great Fox; however, when used on the Corneria stage (in which players battle on top of the Great Fox), the Landmaster Final Smash takes up roughly half the stage length. Falco's line before starting the move, "Personally, I prefer the air." was later referenced in Star Fox Zero during the Titania mission. Video of Landmaster "destruction" through hacking. This page was last edited on April 8, 2019, at 21:43.